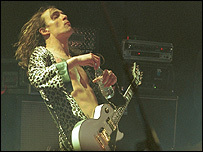 Justin Hawkins - former frontman of glam rock band The Darkness - is hoping to sing at the Eurovision Song Contest. The singer and guitarist is one of six acts competing to represent the UK in this year's competition in Helsinki. Former East 17 star Brian Harvey, ex-Atomic Kitten Liz McClarnon, and hip-hop group Big Brovaz are also vying to take part. The public will vote for their top song in Eurovision: Making Your Mind Up, to be shown on BBC One next month. 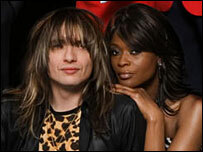 The other contestants are pop newcomer Cyndi and reforming pop quartet Scooch. Only one of the six acts will go to the Finnish capital for the 52nd annual contest in May. Hawkins, who quit The Darkness in October last year, will take to the stage with singer Beverlei Brown to perform They Don't Make `Em Like They Used To. Harvey will perform I Can, McClarnon will sing (Don't It Make You) Happy, and Cyndi will hope to impress the public with her song I'll Leave My Heart. Chart-topping hip-hop group Big Brovaz, who have made a return to the UK music scene as a four piece, will perform Big Bro Thang, while all-singing, all-dancing Scooch will perform Flying The Flag (For You). Daz Sampson finished in 19th place in the 2006 Eurovision Song Contest, in Athens, Greece. with Teenage Life. The contest was won by monster rockers Lordi with the song Hard Rock Hallelujah. They will perform the song during the Making Your Mind Up show. Making Your Mind Up will be hosted by Eurovision veteran Sir Terry Wogan, and TV presenter Fearne Cotton. Sir Terry said: "This year hope springs eternal. Who knows, this could be the year that the UK makes it into the top ten. It's about time." Cotton, who served as a judge on last year's show, said: "I'm delighted to be returning to Eurovision: Making Your Mind Up as a co-host with my pal Terry this year. "I can't wait to see what tricks the acts have up their sleeves this time. Can anyone top DJ Daz's troupe of school girls? "It's an eclectic mix again this year so it will be anyone's guess who the public will vote for."